Back in the day, first-person dungeon crawlers were a major part of the gaming scene. Western series like Might & Magic and Wizardry introduced a lot of gamers to the genre and helped inspire some of the gameplay designs in Japanese games like Shin Megami Tensei. In more recent years, the genre has died off a bit outside of Etrian Odyssey, but Kadokawa Games is looking to be part of their resurgence with Demon Gaze. So, how does this throwback title fare in today’s modern gaming environment? When you start, you’re given the chance to customize your character a little: choose from a series of character images, voices, etc. However, even though you can pick a name, male or female voices, and a variety of character portraits, the game quickly warns you that you will be treated as a male for story purposes, which makes some of the customization a little pointless. After starting on that high note, your hero wakes up with a case of explosive amnesia in what looks like a jail cell. After escaping, the hero finds himself in the basement of an inn populated by mercenaries of all shapes and sizes. The proprietress of the inn is a woman named Fran who sends you on a quest to stop the evil Sol, which first requires you to capture a number of escaped demons. The story, while flimsy at times, offers considerably more meat than the average dungeon crawler. You are provided with several spoiler-filled reasons why this quest is vital as the story progresses, which is more than enough to keep dungeoneering. Most of those reasons revolve around the various characters you meet at the inn, from Fran herself to fellow mercenaries to the staff of the inn. The game offers a little in the way of relationship building with some of the characters, but the dialogue and approach sometimes make this hard to take seriously; the hero gets put in some rather suggestive situations that really don’t necessarily help the plot. 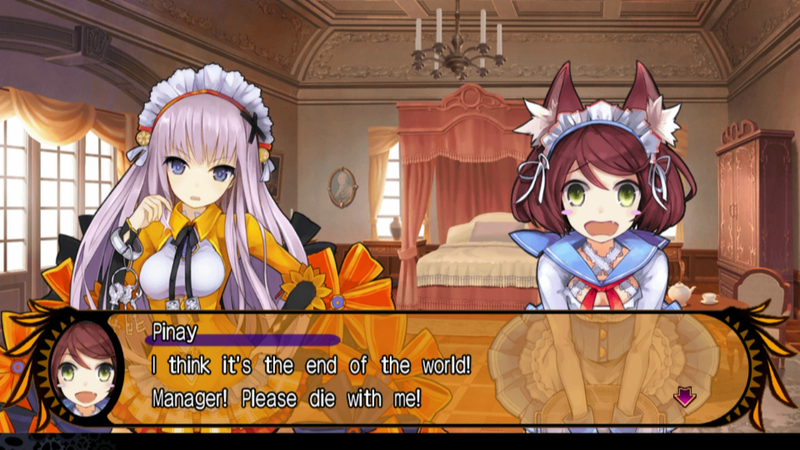 For the most part, Demon Gaze plays like the games of old. Your base of operations is the aforementioned inn. 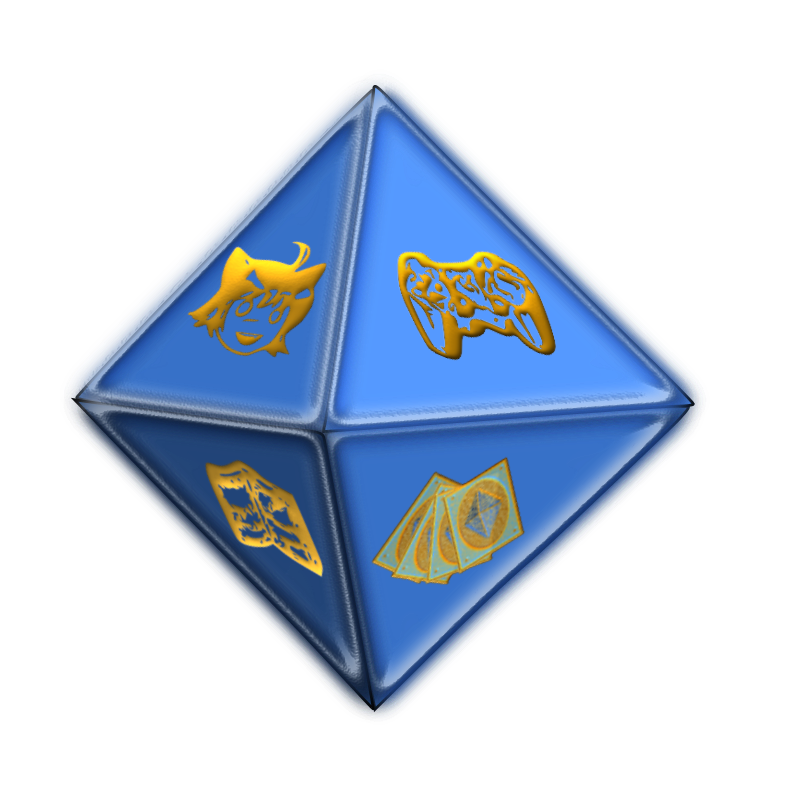 There, you can recruit a party of five (including your hero) from seven fairly standard classes like paladin, healer, and ranger, and you can pick up and turn in quests. Yes, as any good dungeon crawler should, Demon Gaze offers a quest system, but as with everything in the game, it’s just a little off. Some of the descriptions are unclear, and if you miss a vital piece of information (e.g., the location) , the quest descriptions don’t always help. The inn also has a stylist for customizing your party’s looks and voices, as well as weapon and item shops, though you won’t have too much use for them in the late game, as you will get all you need from dungeon crawling. The dungeons themselves are gridded out and you move tile-by-tile as you explore them, though once you’ve mapped out an area, you can pick a destination and the game will move you there, which does speed things up a bit. If you connect the Vita to the Internet when you enter a dungeon, you will find notes left by fellow players, a la Dark Souls. And like the Souls series, some of these notes are helpful, some of them are lies, and some of them are completely off-topic, so caveat emptor whenever you read one. One other issue with these notes is that you will traverse certain areas a few times, so some of the notes will inevitably be spoilers for people who are going through a dungeon the first time. There are random encounters in the dungeon and also symbols which represent enemies, items and “Demon Circles.” At these circles, you place gems which summon enemies to fight; depending on the types of gems placed, you’ll be rewarded with various equipment which is almost always better than what you can buy at the inn. Once all the circles in a given dungeon are activated, the boss demon will appear for battle. 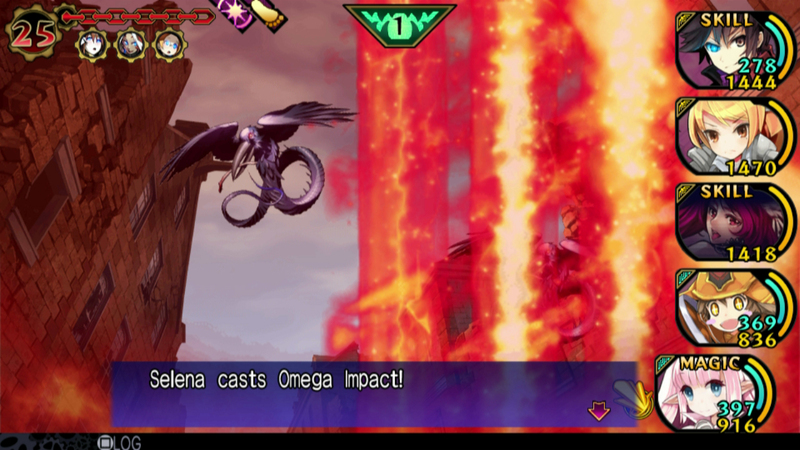 Most of the bosses are named after Roman gods (except Hermes was used in place of Mercury, for some odd reason), and upon defeat, the hero uses the titular Demon Gaze to bring them under his power. Battles are fought in a traditional turn-based style, and along with the standard fight and magic commands, each class learns a set of special skills that are vital to success. These can vary from doing multiple attacks to creating a shield that deflects a considerable amount of damage each turn. In addition to these skills, once a demon is defeated, the hero can summon them to battle as a sixth party member for a short time. The hero can select up to three demons to bring at a time, each with their own bonuses in and out of battle (e.g., finding secret doors, or offering major health boosts). One nice thing about the battle system is that once you set up an effective set of commands, you can have the commands repeat without having to direct each party member every time. This is perfect for when you’re taking part in some of the game’s inevitable level grinding. Unfortunately, even with all of these weapons in your arsenal, the game isn’t a cakewalk thanks to a few severe and sudden spikes in difficulty. While most of the game offers a pretty reasonable progression, you might find yourself blindsided by enemies moving from one dungeon to the next. Getting trounced by some rabbits after capturing a demon doesn’t seem too reasonable, but if you don’t mind grinding, the playing field levels out fairly quickly. And, if you find yourself hopelessly stuck, the difficulty is adjustable on the fly, so making the game easier is always an option. The visuals and audio hint at the game’s lower production budget. Outside of the 2-D character and enemy portraits, the game has little to offer in the way of graphics. The dungeon designs are bland and grainy, and while each one is a different style, they quickly become visually repetitive. And while the game offers a number of different voices for each character, each only has a few snippets of audio that play during battle. The result is, after tens of hours of playtime, you’ll consider taking your character to the in-game stylist just to change their voice (and their looks as well, if you want). Dialogues with the supporting characters are only partially voice acted, as well, which is unfortunate. The one saving grace is that there are a couple of nice background music pieces. In the end, Demon Gaze isn’t perfect, but if you are dying for a new dungeon-crawler, it can fill the need with its 30-plus hour storyline. While it feels like a budget title at times, it has its good points, too.